Just bought an 02 5sp is300 with 120k on it, and I don't know too much about the previous owner before me (nor the car... Yet). I'm looking for watch outs and parts to replace/upgrade as I'll be turning it into a daily driver/ drift car (probably once or twice a month till more $$ comes in). I do know that the timing belt was changed at 90k, and it feels like it's still the original suspension... Any suggestions on everything to look for? Any feedback would be great! 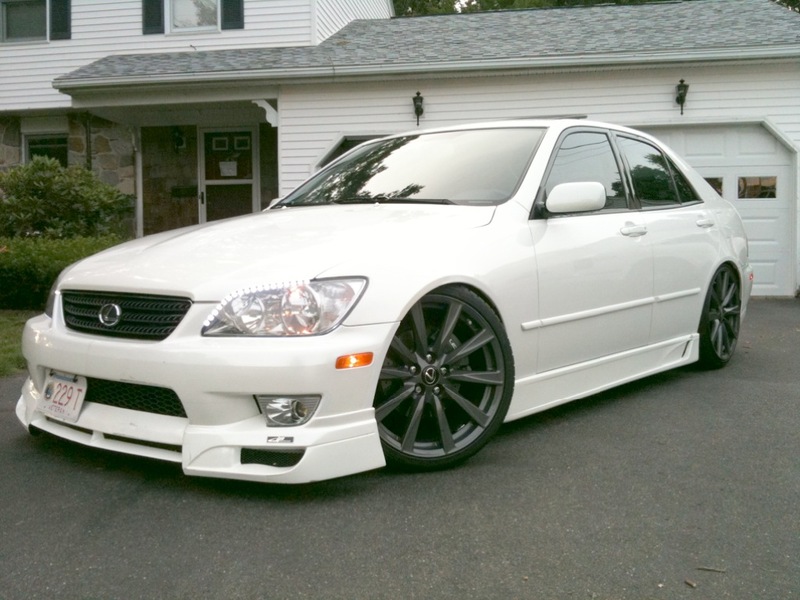 So what's the best setup of angle and camber for drifting the IS300? for tires i try and go as wide of tire as i can on the front since you want it to grip though ive noticed too much grip on front can be a bad thing. i got bfgoodrich gforce kdws on front and when i was na they gripped too much. id go to dori and it would just decide to grip and rip my car the other direction. im still running the same tires but now that iim boosted it doesnt do that i guess cause ive got enough power that i dont have to try so hard to keep it from getting traction. out of all the tires ivevtried on the front(bfgoodrich gforce, dunlop dz101, falken azenis 615..) the falkens work best. they grip good and pretty predictable. dz101s were super predicctable but not as grippy. backs are just whatever so far. bridgestones are good tires. seem to have the record for lasting the longest have good grip. I have MeganRacing suspension parts all around and I love it to put a very low camber on the front just before drifting. I put it to max. negative about -4 to -5° of camber on the front. It makes your car much more stable drifting in a very sharp angle to the track's direction, since when your steering is on the max. angle the inner wheel always wants to lean out rolling on its outer edge instead of the whole surface, so you're loosing grip and therefore you can prevent this when lowering the camber. Helps a lot! On rear suspension I am going about -1° of camber. Last edited by Artiewhitelex; 07-05-2011 at 08:47 PM. Drifting on 19" wheels? Are you in the right thread? Last edited by JohnnyChimpo; 12-07-2011 at 12:56 AM. My last alignment i had -1.5 in the front and -2.0 in the rear. I plan to get alot more aggressive this year. anyone know whether or not a set of Tein FLEX coilovers w/ EDFC would be adequate/suitable for sliding? keep in mind the car will be a DD on chicago roads.